renovated cafe with the help of our friend and fellow plant enthusiast, TJ Kyes. 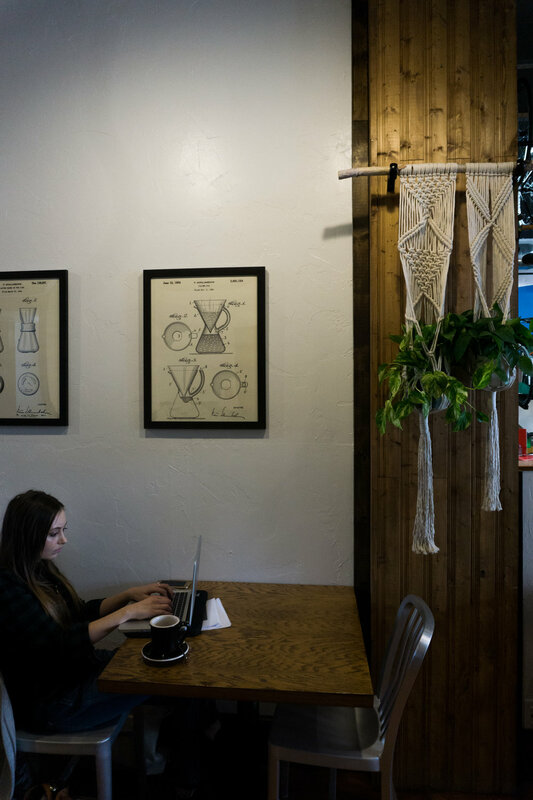 Located on 24th and Harney in Omaha, Muglife shares a space with Greenstreet Cycles. the cafe was the perfect candidate for an abundance of green. Pothos (one of the plants we used most during this project) finds a new home in a custom macrame wall hanging. Brenna and Matt wanted to offer more seating for their customers, and streamline the cash wrap/waiting area. Custom built retail shelves, handheld menus, and lots of green were all part of Brenna's plan for the first few steps into the shop. A pop of color at the cash wrap invites customers into the space, while thoughtfully placed retail shelves help direct traffic flow. A variety of cacti and succulents bask in the sunny south window. Swedish Ivy takes center stage above new signage, surrounded by three varieties of Pothos. 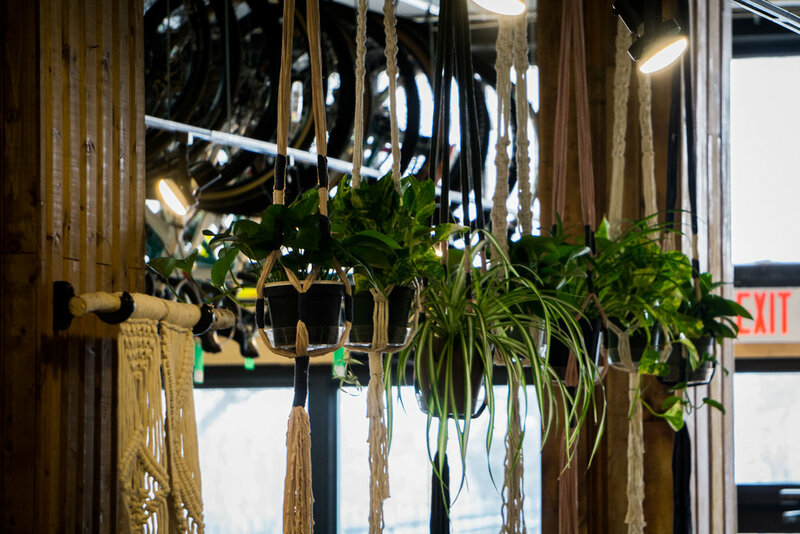 Custom macrame plant hangers hold pothos and spider plants and act as a living "wall" between the cafe and bike shop. separated by a half wall and was primarily occupied by the bike shop. on either side of the couch and hold more of the pothos plants we loved for this space. Custom macrame pieces hold more pothos plants on either side of this vintage sofa. and the occasional bike wheel propped up on a coffee table. This curtained space initially served as a dressing room for the bike shop. With the third wall removed and added bench seating, the former dressing room is now the perfect study nook. We stashed a few spider plant babies as well as a dieffenbachia in the tiny west facing window. Where bikes once hung, contractors constructed a beautiful pergola that we look forward to filling with plants in the spring. TJ tending to one of the multiple spider plants in the new space.